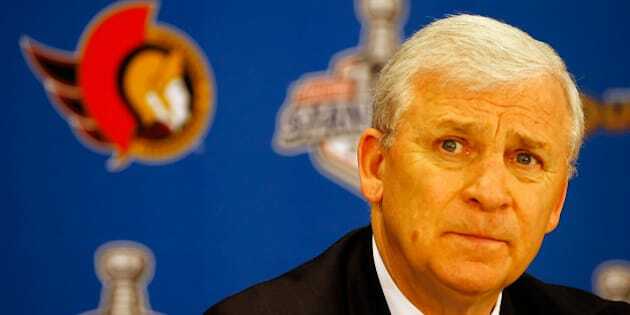 OTTAWA - Ottawa Senators general manager Bryan Murray revealed that he has Stage 4 cancer in an interview on TSN that aired Thursday night. Murray had said that he had cancer in a statement on July 7, but the severity of his illness was not made public at that time. The statement issued through the Senators said he would begin treatment immediately. "There is no cure at this point for me," Murray told TSN on Thursday. "The word is that we'll keep doing chemo and hopefully reduce the tumours and the effect and I'll get some time out of that." The interview was broadcast while Ottawa played the Edmonton Oilers in Alberta. Head coach Paul MacLean addressed the interview after Ottawa's 4-3 overtime win. "The team obviously has tremendous respect for Bryan and the fight that he has in front of him," said MacLean. "The team stands behind him 100 per cent. We know that we are all going to be with him and help him the best that we can. "We haven't seen the story ourselves yet, but we know the kind of person he is and that we are all there for him." Murray was diagnosed on June 23rd, although his doctors believe he has been living with the disease for years. "The doctor told me very matter of factly that I had cancer. I had colon cancer within my liver and I had some in my lung. That it was very serious and that I had to get into treatment right away," said Murray, who has been undergoing chemotherapy since being diagnosed. "That's the indication that they gave me, seven to 10 years (undetected). And, obviously, because of the Stage 4, it had moved through my body." Since announcing his condition this summer Murray has tried to raise cancer awareness through the team. "It's a battle, there's no question," said Murray. "There's a lot of emotion involved in it. There's a lot of down days. You try not to have too many. There are a lot of good days and you try to have more of them."